Are you looking for a place? We tell you how to find it. Are you poorly paid for your work? We tell you how to get better wages. Have you goods you want to sell? We suggest new plans. Are the profits of shop, store, office, or farm unsatisfactory? We tell you how to increase your income. This textbook begins by introducing the area of technology-based entrepreneurship (TBE), taking into account definitions and background of the subject area, and sets this into context through TBE Education and Regional Development. Do you have an idea for a business? 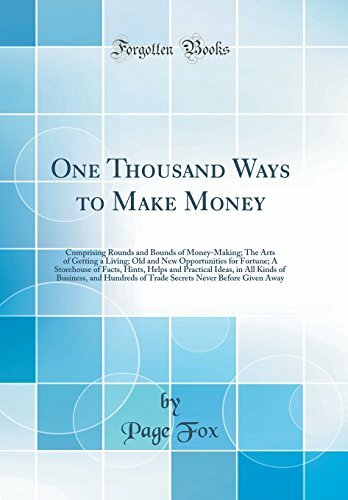 This book will help you to determine how to go about turning your idea into reality and cash. More importantly, as a first step it will help you determine if the idea is even worth pursuing in the first place. An Introduction to Franchising is designed to introduce young people to the fascinating world of franchising. Many people think of fast food restaurants when they think of franchising. But there are many more types of franchise businesses. Kitchen Table Entrepreneurs make the best of what they have in terms of their personal skills, which means they start their businesses from where they are standing right now. This guide helps you to turn this hobby into a profitable business.